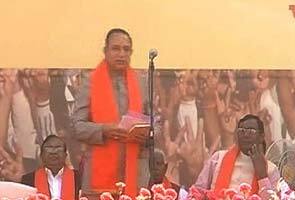 Ahmedabad: Babu Bokhariya, a senior minister in the Narendra Modi cabinet in Gujarat, has been convicted for illegal mining. He has been taken into custody. Mr Bokhariya, who is Gujarat’s water resource minister, along with three others, has been sentenced to three years of imprisonment by a sessions court. The three others convicted in the case are former MP Bharat Odedara, Bhima Dula and Laxman Dula. They all were accused of illegal mining of limestone from the land where Saurashtra Chemicals Limited holds mining rights.